About this Desk In A Box:Are you afraid of running out of rubber bands? When you don’t have enough office supplies at your desk, you can feel unprepared. Prevent your employees from getting anxious with a Desk in a Box. Looking for a promotional item that appeals to a mature audience? This is an office supply item for adults, not for small children. The box is even labelled with a sticker that reads, “not intended for children under 12 years”, because we included a tiny little stapler (and real staples). If MacGuyver could get one promotional product from AnyPromo, he’d get the Desk in a Box. It comes with rubber bands, tape, post-it notes, paper clips, a stapler and staples in a compartmentalized box. Mini desk items including a stapler, staples, paper clips, rubber bands, transparent tape, sticky notes & sticky flags.Organized box for easy use. Full Ofﬁce Supply Kit Handy Snap Lid Box Free Rush Screenprint Full Color Print Available Full Office Supply Kit Take your office with you anywhere with this full kit featuring a tape, paper clips, a stapler, rubber bands, and more. Handy Snap Lid Box This handy compartmentlized box is very versatile and can be re-purposed as a miniature tackle box, pill box, and more. Free Rush Screenprint Do you need an awesome office giveaway in a hurry? Get free 1-day rush production with single color Screen Printing. Full Color Print Available If you want to print a colorful logo or design, we have digital four color process printing available for the Desk in a Box. NOTE: Product comes with Prop 65 warning label. Label reads: "WARNING: This product may contain carcinogen, which is known to the State of California to cause Cancer. For more information, go to www.P65Warnings.ca.gov. Special Instructions:1 day rush is available on all in-stock items, one color/one location imprints, and laser engraved orders. About this 7 In 1 Stationery Kit:Kit Includes: Stapler, Staples, Sticky Notes, Paper Clips, Hole Puncher, Tape Dispenser And Rubber Bands.Snap Close Fastener.Special Instructions:Rush Service:Catalog Quantities Only.One Color And One Location. About this Stationery Set in Metal Box:Keep yourself organized with our desktop stationery set. Materials: Aluminum, PlasticSpecial Instructions:Rush Service:The standard imprint method, 1-color/ 1-location is available. About this School Pouch:Constructed of 15 mil PVC CPSIA compliant.Special Instructions:Rush service: 1-color/1-position required. Item color assortments are not available. About this Clear Translucent School Kit - 2 Pencils, Wood Ruler, Crayon, Pencil Sharpener:Clear Translucent Packet with colored trim.2 Round Pencils.1 Natural Finish 6" Wood Ruler.1 Crayon - unimprinted.1 Pencil Sharpener - unimprinted. Special Instructions:Warning: Choking Hazard. Small parts. Not for children under 3 ys. 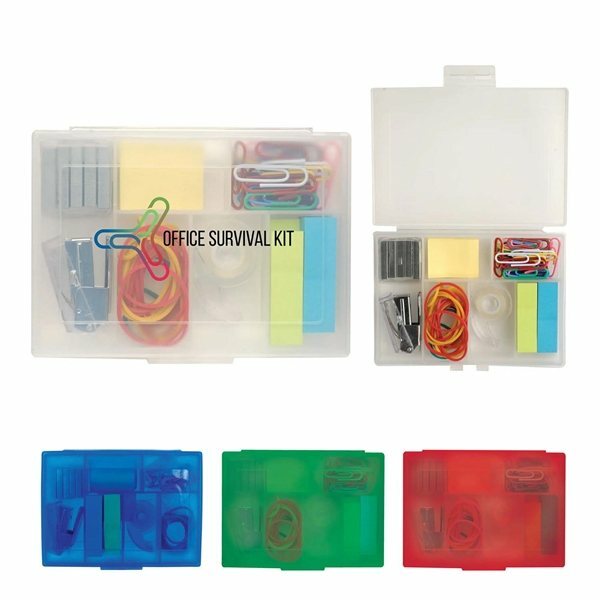 About this Mini Stationery Set:Clear plastic case holds an assortment of office essentials: cello tape, paper clips, paper punch, stapler, staples, rubber bands & sticky notes. Large imprint area. About this Clear Translucent School Kit:Clear Translucent Packet with colored trim.2 round pencils.1 natural finish 6" wood ruler.1 eraser.Special Instructions:Warning: Choking Hazard. Small parts. Not for children under 3 ys. About this Translucent School Pouch:Colorful and translucent Constructed of 15 mil PVC CPSIA compliant.Special Instructions:Rush service: 1-color/1-position required. Item color assortments are not available. About this Zippered Portfolio Pouch W / Three Holes:Be the envy of the classroom when you break out this promotional item!Constructed of PVC material, you'll stay organized and at the head of the class with our 0.3mm clear Teachers Pet 3-ring organizer.Great for schools, company giveaways and office supply stores, this pouch will fit into any standard 3-ring binder.Offered in several attractive colors, put your brand on display using the large imprint area.Material: PlasticSpecial Instructions:Rush Service:May only be used on regular web quantity orders and one color imprints. About this 3- Piece Smart Box:The 3-piece smart box is crafted with cardboard and covered with colored paper. Three sizes offer simple organization for pens and other small desk accessories.Special Instructions:1 Day Rush, available upon request for 1 color, 1 imprint location orders. About this Academic School Kit:Translucent School Pouch includes: Three Jo-Bee Miser Round Pencils Competitor Stick Pen 6" Plastic Ruler Jumbo Eraser without imprint White pencil sharpener without imprint. About this Deluxe School Kit:School Pouch includes: Jo-Bee Miser Round Pencils Round Eraser without imprint 6" Wooden Ruler White pencil sharpener without imprint. About this Super Value School Kit:School Pouch includes: Jo-Bee Miser Round Pencils Eraser without imprint White pencil sharpener without imprint. About this Translucent Deluxe School Kit:Translucent School Pouch includes: 2 White Jo-Bee Miser Round Pencils White Round Eraser without imprint White 6" Plastic Ruler White pencil sharpener without imprint. About this Iridescent School Kit:Zipper closure secures school supplies.Shimmering material will stand out.Fits most standard 3-ring binders.Adheres to CPSIA guidelines and marking requirements.Includes two blank white Jo-Bee Miser Round Pencils, a jumbo eraser, a 6” wooden ruler and a pencil sharpener. About this Ruler Stationery Set:This 4-in-1 stationery set features a ruler, sticky notes pad, 10 assorted colored paper clips and 3 different colored sticky note tabs. The ruler measures 5 1/2" in length with a measurement capability of both millimeter and inches. Imprint your company name and logo on the top to promote educational institutions, retirement communities, hospitals, elementary schools and more! Packed in individual poly bag NOTE: Product comes with Prop 65 warning label when shipped to California. Label reads: "WARNING: This product may contain carcinogen, which is known to the State of California to cause cancer. For more information, go to www.P65Warnings.ca.gov. About this Clear Translucent School Kit - 2 Pencils, Wood Ruler, Eraser, Pencil Sharpener:Clear Translucent Packet with colored trim.2 Round Pencils.1 Natural Finish 6" Wood Ruler.1 Eraser.1 Pencil Sharpener - unimprinted. Special Instructions:Warning: Choking Hazard. Small parts. Not for children under 3 ys. About this Clear Translucent School Kit - 2 Pencils, Wood Ruler, Spirit Click Pen, Pencil Sharpener:Clear Translucent Packet with colored trim.2 Round Pencils.1 Natural Finish 6" Wood Ruler.1 Spirit Click Pen.1 Pencil Sharpener - unimprinted. Special Instructions:Warning: Choking Hazard. Small parts. Not for children under 3 ys. About this Clear Translucent School Kit - Pencil, Plastic Ruler, Eraser, Pencil Sharpener:Clear Translucent Packet with colored trim.1 round pencil.1 plastic 6" ruler.1 eraser.1 pencil sharpener.Special Instructions:Warning: Choking Hazard. Small parts. Not for children under 3 ys. About this Premium Translucent School Kit (Includes Pencil Sharpener):Premium Translucent packet.2 round pencils.1 Natural Finish 6" Wood Ruler.1 Eraser.1 Pencil Sharpener - unimprinted.Special Instructions:Warning: Choking Hazard. Small parts. Not for children under 3 ys. About this Premium Translucent School Kit (Includes Pen):Premium Translucent Packet.2 round pencils.1 Natural Finish 6" Wood Ruler.1 Spirit Click Pen.1 Pencil Sharpener - unimprinted.Special Instructions:Warning: Choking Hazard. Small parts. Not for children under 3 ys. About this Premium Translucent School Kit (Includes Crayons):Premium Translucent Packet.2 round pencils.1 Natural Finish 6" Wood Ruler.1 Crayon - unimprinted.1 Pencil Sharpener - unimprinted.Special Instructions:Warning: Choking Hazard. Small parts. Not for children under 3 ys. About this Premium Translucent School Kit:Premium Translucent Packet.1 Round Pencil.1 natural finish 6" wood ruler.1 eraser.1 Pencil Sharpener - unimprinted.Special Instructions:Warning: Choking Hazard. Small parts. Not for children under 3 ys. About this Premium Translucent School Kit:Premium Translucent Packet.2 round pencils.1 natural finish 6" wood ruler.1 eraser.Special Instructions:Warning: Choking Hazard. Small parts. Not for children under 3 ys. About this Premium Translucent School Kit - Pencil, Plastic Ruler, Crayon, Pencil Sharpener:Premium Translucent Packet.1 Round Pencil.1 Plastic 6" Ruler.1 Crayon - unimprinted.1 Pencil Sharpener- unimprinted. About this Premium Translucent School Kit - Pencil, Plastic Ruler, Eraser, Pencil Sharpener:Premium Translucent Packet.1 Round Pencil.1 Plastic 6" Ruler.1 Eraser.1 Pencil Sharpener - unimprinted.Special Instructions:Warning: Choking Hazard. Small parts. Not for children under 3 ys. About this Varsity School Pouch:Constructed of 600D polyester.Zipper pouch.Reinforced metal holes.Fits most standard 3-ring binders.Adheres to CPSIA guidelines and marking requirements.Special Instructions:Rush service: 1-color/1-position required. Item color assortments are not available. About this School Kit:Made for the everyday student, our School Kit is essential for keeping your supplies organizedThis 5-piece set includes a 6" ruler, pencil sharpener, eraser stick and a #2 pencil (all items inside pouch come assorted colors only)The items come packed in a handy PVC zipper case(available in your choice of red, black, blue, yellow, or white trim)Customize with an imprint of your brand name and hand out at school fairs and educational seminarsNo project will go undone with this on hand NOTE: Product comes with Prop 65 warning label when shipped to California. Label reads: "WARNING: This product may contain carcinogen, which is known to the State of California to cause cancer. For more information, go to www.P65Warnings.ca.gov. About this Honor Roll School Kit:Twin Pocket Supply Pouch includes: Two Jo-Bee Miser Round Pencils Round Eraser without imprint 6" Wooden Ruler White pencil sharpener without imprint. About this USA Back to School Kit:School Supply Case includes: 3 White Jo-Bee Economy Line Round Pencils 6" plastic ruler. About this Varsity School Kit:Constructed of 600D polyester.Zipper pouch.Reinforced metal holes.Fits most standard 3-ring binders.Adheres to CPSIA guidelines and marking requirements.Includes two blank white Jo-Miser Round Pencils, a blank white Competitor Stick Pen, a jumbo eraser, a 6" wooden ruler and a pencil sharpener. About this Intelligent Pencil Pouch School Kit:Translucent front with a colorful back. Pre-punched holes for easy insertion in notebooks. Includes imprinted buy write pencil, stylus,natural finish 6" ruler, assorted non-imprinted rase-a-round eraser and white pencil sharpener. Warning: Chocking Hazard - Small parts. Note for children under 3 yrs. NOTE: Product comes with Prop 65 warning label. Label reads: "WARNING: This product may contain carcinogen, which is known to the State of California to cause Cancer and Reproductive Harm. For more information, go to www.P65Warnings.ca.gov. About this Premium Translucent Vinyl School Kits, Full Color Digital:Translucent packet.Packet Size,9-1/4" W x 6" H.2 Round Pencils.1 Natural Finish 6" Wood Ruler.1 Eraser.1 Pencil Sharpener.Special Instructions:Warning: Choking Hazard. Small parts. Not for children under 3 ys. About this Premium Translucent Vinyl School Kits, Full Color Digital:Translucent Packet.1 Round Pencil.1 Natural Finish 6" Wood Ruler.1 Eraser.1 Pencil Sharpener.Special Instructions:Warning: Choking Hazard. Small parts. Not for children under 3 ys. Thank you Kaleb, Malachi and Ashley! Our Desk in a Box is a great promotional item for trade shows and as an employee incentive! The Desk in a Box is convenient to carry around with all the office supplies you may need. You won’t need to go looking for a stapler with this stationery set. All the supplies included is what makes the Desk in a Box a top seller. Available in clear, blue, translucent green, translucent red. Thank you Miranda and Nolan! We’re glad to read your positive reviews on the 7 in 1 Stationery Kit. This 7 in 1 Stationery Kit is a top seller because of all the supplies included inside. You can have convenience at the tip of your fingers with this promotional stationery set. Kit Includes: Stapler, Staples, Sticky Notes, Paper Clips, Hole Puncher, Tape Dispenser And Rubber Bands. Purchase your 7 in 1 Stationery Set today! Thank you Brandon and Rebecca! Our Mini Stationery Set is great for you to take anywhere. The sizing helps you store this set just about anywhere! In our selection of promotional stationery sets, we have different types to fit your company’s promotional needs. We have mini stationery sets, 7-in-1 stationery sets, school pouches, school kits, pencil pouches, and more! Stationery sets are great to give to anyone! Who doesn’t love stationery supplies? AND in a set? Sign us all up! Stationery sets are convenient for offices, schools, and more! You can have all the office supplies you need at your disposal. Don’t let this great marketing tool slide by! Use stationery sets to represent your company name or school name. Employees and students will love to have these! Look through our selection of stationery sets. Shop here! At AnyPromo, we place a high standard on brand impact, just like our customers. Search our site for a wide selection of promotional stationery sets and see for yourself. Trade show and event guests are bombarded with boring branded swag at every opportunity, so it is extremely important to stand out. Our custom stationery is specially priced and proven to generate impressions. Click through our inventory of promotional stationery on sale now. Here is a snapshot of our selection of 48 custom stationery options. We’re ready to help expedite your order, so give us a call! Grab your promo stationery swag today! Stationery sets are great for offices, daycares, schools, and more! You can place your logo in the center of the set and give these out at your next event. Exhibiting at a trade show? Give your guests a stationery set to take around the show. If they need anything to help them take notes, it’ll definitely be in the stationery set! Own this great marketing set! Our featured list of stationery sets are great for everyone to have! When it comes to office supplies, customers love to receive them. Don’t miss out on these hot and trending items.